What Can Fit on the Head of Pin? We don't know how many angels can dance on the head of a pin, but now we know how many words of God can be inscribed on one. Scientists at Haifa's Technion institute in Israel have inscribed the entire Hebrew Bible, complete with vowels, on a silicon surface smaller than the head of a pin. Join us on a Holy Land Pilgrimage in 2008!! Click here for a brochure for the Pilgrimage in April!! To listen to Steve's radio show on Bethlehem, click here. 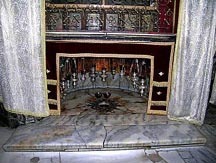 To the right are pictures of the star marking the place where Jesus was born. 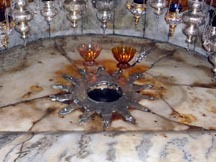 It is under the Church of the Nativity in Bethlehem. Jesus was born in a cave and the church was built over the cave. Step into the Church here. How do we know this is really the place of Jesus' birth? I explain that here. Want to take a virtual video tour? Then visit my Virtual Pilgrimage page and scroll down to the days we visit Bethlehem. You may also enjoy reading Did the Wise Men Meet the Shepherds? and a story of the Nativity accounts. Bethlehem is also featured in our on-location adventure DVDs Mary, Mother of God and Jesus, the Word Became Flesh. Order one or both before Christmas and receive a free copy of Steve Ray's talk "Defending the Eucharist." For our pilgrimages to the Holy Land in February and April and November 2008, click here. Merry Christmas from the Ray Family! Russell Tisdale was born into a Oneness Pentecostal family, then touched by the Assemblies of God. He also came close to Eastern Orthodoxy before becoming a Catholic. You can read his interesting story here — and after you do, leave a Reply at the end to welcome him home. What Famous Christmas Carol is This? ABCDEFGHIJKMNOPQRSTUVWXYZ It is a clever riddle, but see if you can figure it out. (Opps, sorry, I had a mistake in this riddle which is now fixed! – 12-16-07) The answer is in the Comments below; don't look until you give up! A Father and Grandfather becomes a Father!